A mini review of the three different capos that I’ve owned. The Kyser is probably the most widely used capo that I’ve seen – you even see real working professional musicians using these all the time. 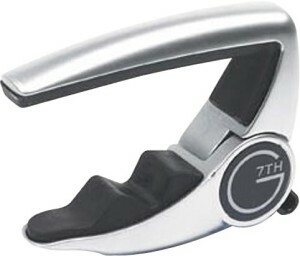 Seems like everybody has one of these, and it was my first (and second, and maybe even third) capo. They are pretty inexpensive at around $14 or $15. The Kyser has a few things going for it that I like, and a few that I don’t. Overall the Kyser is a solid capo and I’d recommend it. But, you can do better. Planet Waves has re-designed this since I purchased the couple that I have. Now it looks like there is a pick holder built in, and the arm down the back is curved and is attached to the adjustable tension arm. I would assume this is a good move – I’ve heard that these can fall apart on the tension arm, so I’d guess this would solve that problem. I have two of these and I’ve used them a lot over the years, and they have been rock solid for me. Adjustable tension – this is great because you can change the tension so that your strings ring out clear without being pulled too tight. This helps keep things in tune as you use a capo. If you use guitars with different necks, this is especially helpful. On my Martin D-35, the material that sits against the guitar pulls off the finish. I use these capos on my electric guitars, but not on my Martin anymore. This is a pretty big con, in my opinion. It only does this if I leave the capo on for long periods of time (which is not recommended anyway). It could just be my particular guitar – the finish seems extra delicate on it. 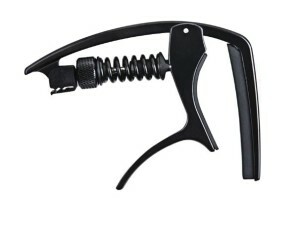 Overall I really like the Planet Waves capo, but beware how it interacts with the finish. This one is by far my favorite capo. It’s about twice as much as the Planet Waves capo, but if you use a capo a lot, do yourself a favor and get this one. It is much more minimal than the others, and it works extremely efficiently. To place the capo, simply squeeze it. The tension applied is totally up to you. Once you get the hang of how hard to squeeze the capo down for the appropriate tension, you’ll apply the perfect amount on any guitar you put it on. It’s a pretty awesome design. To remove the capo, just pull the lever and remove. There’s just something about this capo – the engineering, the materials, etc. It’s very satisfying to use. None. Get one now – seriously. Personal preference but I’ve used all off the above. Kyser is by far the better capo than the rest never had any damage to the strings or guitar which is essential. Wow.. The last capo is cool! But it is so expensive. It’s “expensive” only if you don’t consider that you’re using it on a $500 or $2000 guitar… if you aren’t afraid to spend money on your instrument, the same should be true for the other tools of your craft. A professional painter wouldn’t paint with a toy brush, and a chef wouldn’t cook with an EZ-Bake oven. I’ve got a Kyser and the Planet Waves (or D’Addaio, it’s the same company) capos. I personally like the Planet Waves capo quite a bit. I’ve never had an issue with the finish being pulled off on by Epiphone Masterbilt, and I typically leave it clamped on the head when I’m not using it, and sometimes it’ll stay there for days at a time. I ended up getting the Planet Waves, because I found the tension and angle of the trigger on my Kyser capo to be a little difficult when it came to making quick adjustments to the placement. The trigger on the Kysers ends up being out in front of the neck, for those wondering. The trigger on the Planet Waves, however, is behind the neck and in my opinion much easier to operate on the fly. The adjustable tension was also a big factor for me. And yes, the new Planet Waves model does have a pick holder… but I never use it. It’s a bit awkward to grab a pick with my left hand and then have to pass it on to my right (strumming) hand. It’s just easier for me to put the pick in my pocket and dig it out with my right hand. Thanks Paul! I asked a luthier recently about the finish coming off my Martin, and he said it probably has more to do with the oils and other chemicals on my hands reacting with the finish, which allows it to be more fragile and come off much more easily than it should. Kind of makes sense when I think of it that way.